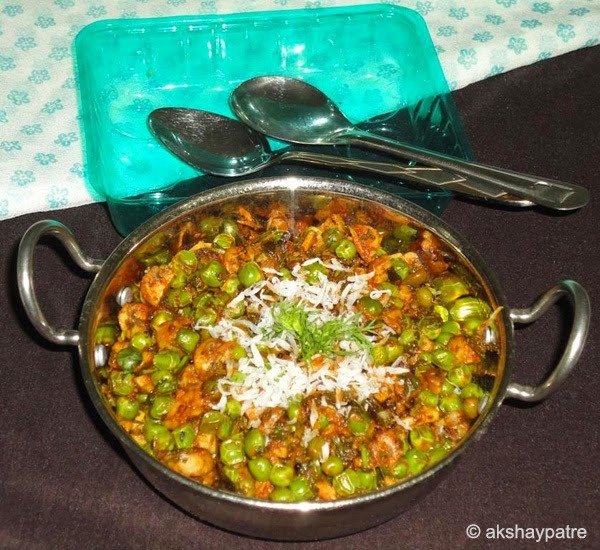 Matar mushroom bhaji - Today I have come up with matar mushroom bhaji for you all. Here button mushrooms are available throughout the year and you can make varieties of dishes with it. Though the green peas are seasonal, frozen green peas are available in any grocery store. This bhaji is really a spicy version with full of aroma. It is very simple to prepare and the whole process takes few minutes. I am sure, you will definitely enjoy the preparation and taste of this bhaji. I have added kala masala to give it a twist of Maharashtrian tatse. Kala masala is totally optional. If you don't have kala masala, you can use garam masala instead of kala masala. Heat the oil in a pan and add the jeera, hing and curry leaves. Add the chilli powder, kashmiri chilli powder and turmeric powder. Add salt. Saute for 30 seconds. 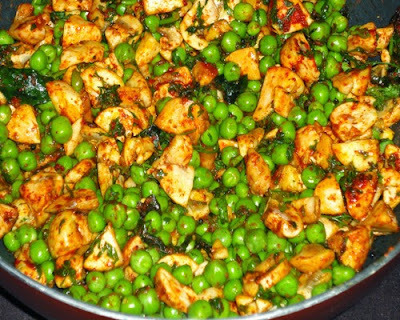 Add the green peas and mushrooms. Saute for 2 - 3 minutes. Cover the pan with lid and cook on low flame. Remove the lid and stir in between. Cook on low flame till the mushrooms and green peas become soft. Once they are soft, add the garam masala, kala masala, stir to combine and saute for a minute. Add the grated coconut and chopped cilantro. Mix well and serve matar mushroom bhaji hot with chapati and rice with curry. Wash the mushrooms under running water and scrub with your finger tips to remove the dirt. Usually farm fresh mushrooms tastes better than the refrigerated ones. If you have liking for potato, add a potato while preparing this bhaji. Kashmiri chilli powder is optional. It gives vibrant red colour to the bhaji. If you don't use kashmiri chilli powder, increase the quantity of red chilli powder to 1 tsp. 1. Heat the oil in a pan and add the jeera, hing and curry leaves. Add the chilli powder, kashmiri chilli powder and turmeric powder. Add salt. Saute for 30 seconds. 2. Add the green peas and mushrooms. Saute for 2 - 3 minutes. 3. Cover the pan with lid and cook on low flame. Remove the lid and stir in between. 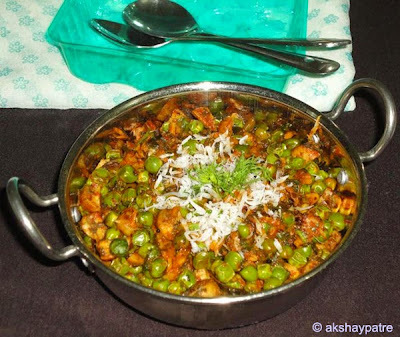 Cook on low flame till the mushrooms and green peas become soft. 4. Once they are soft, add the garam masala, kala masala, stir to combine and saute for a minute. Add the grated coconut and chopped cilantro. 5. Mix well and serve matar mushroom bhaji hot with chapati and rice with curry. It looks great. Yummy yummy.